*Corresponding author. Tel. : +1 765 412 1591; fax: +1 608 262 3322. E-mail address: amin.tayyebi@gmail.com (A. Tayyebi). Land-use legacies, the effects of past land use changes (LUCs) on current social and biophysical processes, can persist for hundreds to thousands of years. Although spatial and temporal data are currently available at a continental scale, they are limited for investigating LUC legacies. The limitations of historical data include a lack of temporal coverage, inaccessibility at coarse resolution, availability only for few land use classes and accessibility for only specific regions. Despite the limitation in data availability, there is an urgent need to develop a data-intensive model that can back-cast multiple historic LUCs at regional scales. We developed a back-cast model for generating historic land use maps with multiple land use classes at a regional scale using a high performance computing (HPC) platform. 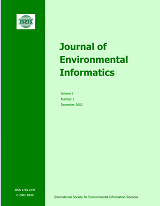 We trained and tested the model using Retrofit Land Cover Change data between 2001-1992 in a backward manner at 1km resolution for three land use categories (urban, forest and agriculture) in the Ohio River Basin (ORB) of United States. We also developed a calibration metric to assess quantity and locational errors for multiple LUCs simultaneously. Results showed that the range that the model underestimated and overestimated the quantity of LUCs was -0.05% to +0.11%. The persistence (over 95%) and location (over 80%) accuracies of multiple LUCs were quantified. We then simulated multiple LUCs annually between 2001-1980 using 2001 as the base year across the ORB. We describe how the output of our back-cast model can be coupled with other environmental models to assess the impact of land use change on ecosystem services.